My Clearwater Winter l Spring 03 south. The construction project is designated to go to bid in spring 2018, and the construction contract will be awarded in the summer 2018. • Cleveland Streetscape Phase 3 is a project aimed at enhancing Cleveland Street in Downtown Clearwater into a pedestrian- and bicycle-friendly street. The roadway will be improved and made safer by adding landscaping and decorative lighting, improving sidewalks, enhancing on-street parking and adding bicycle lanes along the corridor, which stretches along Cleveland Street from Missouri Avenue to Gulf-to-Bay Boulevard and Cleveland Street to San Remo Avenue. Construction is expected to begin in 2018 and be completed in 2019. • The Mercado/Market District is a concept to create a market area and community gathering place with local vendors, weekend markets, music shows and movie nights all in Clearwater’s Downtown Gateway. Timeline for the project hasn’t been finalized. Second Century Studios has served as a great communicator for the city’s urban initiatives, Canary said. There’s information on the city’s website about the initiative and the local media has covered it, but that communication can’t replace the hands-on, straight forward communication offered directly at Second Century Studios, Canary said. “The space has provided that engagement tool,” Canary said. “This has given us the hub to have the two-way communication. I think it has been helpful to have a city representative in the space, answer questions and point people in the right direction.” Before the Nov. 7, 2017, referendum, she recalled meeting people who visited Second Century Studios and weren’t familiar with the city’s urban initiatives. Seeing the large and colorful displays gave them an understanding of the scope of the projects and how they are connected, Canary said. “When you have several big plans, it’s important to see how they come together and relate and show how they have synergy among them.” Helping to draw people to Second Century Studios is the Bazaar Art Zone, which is spearheaded by Bazaar Art founder Jennie Pearl. It brings together more than a dozen local artists who fill the space with wonderful artworks, including landscapes, abstracts and modern paintings. “We have been received with open arms,” said Jennie Pearl, “and this is just the beginning. Art and entertainment are core elements of economic development and community togetherness. 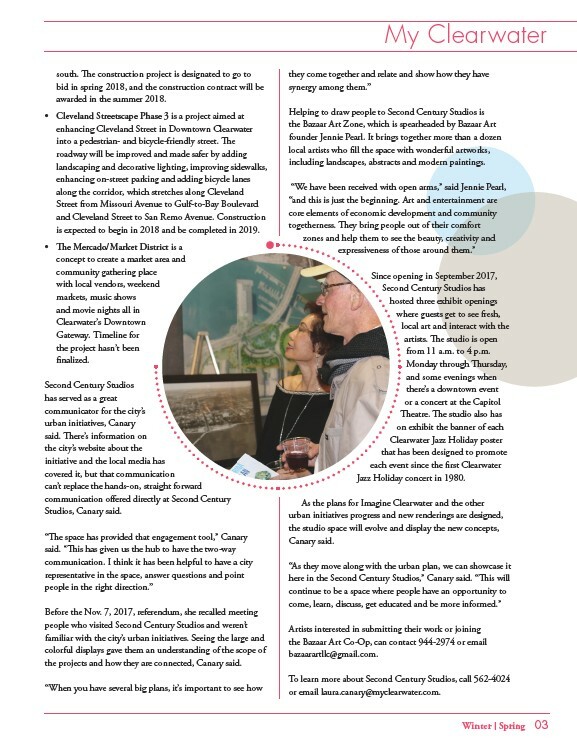 They bring people out of their comfort zones and help them to see the beauty, creativity and expressiveness of those around them.” Since opening in September 2017, Second Century Studios has hosted three exhibit openings where guests get to see fresh, local art and interact with the artists. The studio is open from 11 a.m. to 4 p.m. Monday through Thursday, and some evenings when there’s a downtown event or a concert at the Capitol Theatre. The studio also has on exhibit the banner of each Clearwater Jazz Holiday poster that has been designed to promote each event since the first Clearwater Jazz Holiday concert in 1980. As the plans for Imagine Clearwater and the other urban initiatives progress and new renderings are designed, the studio space will evolve and display the new concepts, Canary said. “As they move along with the urban plan, we can showcase it here in the Second Century Studios,” Canary said. “This will continue to be a space where people have an opportunity to come, learn, discuss, get educated and be more informed.” Artists interested in submitting their work or joining the Bazaar Art Co-Op, can contact 944-2974 or email bazaarartllc@gmail.com. To learn more about Second Century Studios, call 562-4024 or email laura.canary@myclearwater.com.